Although you can buy dried figs all year round you can’t beat the amazing taste and texture of fresh figs. I’m not particularly fond of dried figs so it is more of a treat when the fresh ones come into season. Black Turkish Bursa figs are in my opinion the best and are only in season for a short time in late August and September so take advantage while you can. They look so incredibly gorgeous with their deep purple skin and amber pink flesh flecked with pretty seeds. They have a luscious sweetness with a slight chewy texture that comes from a combination of the skin and seeds. Some food pairings are just classics such as tomato and basil, smoked mackerel and horseradish, chicken and tarragon… and figs with goats cheese is one of them. So, there’s no point reinventing the wheel here and this recipe is a simple salad that is so delicious you could eat it every day of the week and still not get tired of it. I have enjoyed this salad also by roasting the figs with the balsamic vinegar and honey and serving them warm – they taste incredible. It is a special salad whichever way you decide to have the figs. Enjoy. Place dressing ingredients in a small saucepan and place on a high heat. Bring to a rapid boil and reduce for 1-2 minutes until turns syrupy. Remember, it will thicken more once cooled so don’t take it too far as I’ve done on many an occasion! Set aside to cool. Toast walnuts in a dry frying pan until golden. Set aside. 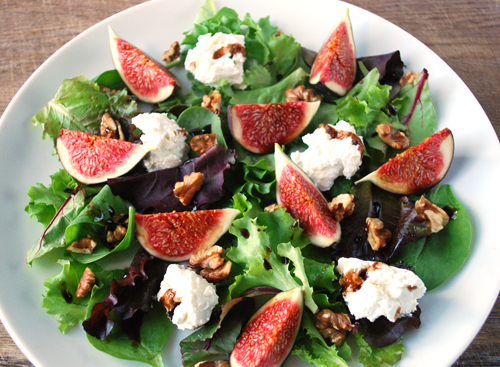 Arrange the salad leaves and figs on the plates then crumble the goats cheese over the salad with a generous drizzle of the dressing. Finish with an extra drizzle of olive oil. 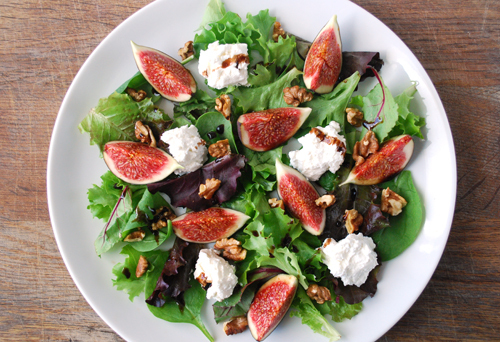 This entry was posted in Recently cooked and tagged balsamic dressing, figs, figs and goats cheese salad, figs goats cheese and walnut salad, figs salad, Fresh figs on 09/11/2012 by Val McArthur. so I can’t make the dressing hours ahead of when it’s supposed to be used?